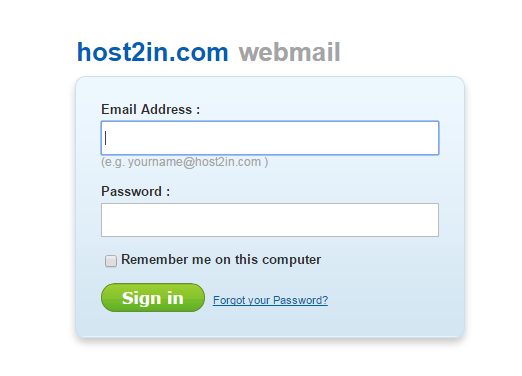 How to Setup a Unlimited Professional Email Address with Host2in Account is about after purchasing a domain name, the first thing any webmaster would like to do is to setup a branded email address ending with the custom domain name. At KADVA CORP, people over and over again ask for email hosting recommendations. A professional email is the one that has your business name in it. For example [email protected] (ex: [email protected]) is a professional email address with host2in rather having [email protected] ,yahoo.com. There are many ways you can setup a professional email. You can use the built-in mail server that comes with most WordPress web hosting providers. Every organization needs to maintain their email records usually they recommend reliable paid email brands but using host2in has many advantages. Not only it is free but it has some splendid features which are as follows. Lots of Space: host2in provides 2+ GB free disk storage so you can easily receive as many attachments as you like but if your disk space is full, then without any hesitations you can ask for more disk space from hos2in support. More fun, less spam: host2in has made the world of email spam free so you don’t need to worry about spammed emails because it automatically deletes unwanted emails, before it reaches your inbox. Email Search: host2in allows you to search emails like search engine and with instant search technology you can find the exact message by entering a few keywords. Security at its best: host2in has always tried to fulfill the basic needs of its users and in order to provide full proof security hos2in has utilized encryption to keep your mail secure. All This For Free: You will get all these spectacular features for free. Create Feedburner Email Subscription Service for your Blog is very easy, see how ??? So, Friends this is all how to create professional email address with host2in and give a bust to your online presence or you may earn more with this email marketing technique, also. Hope this article you find useful.